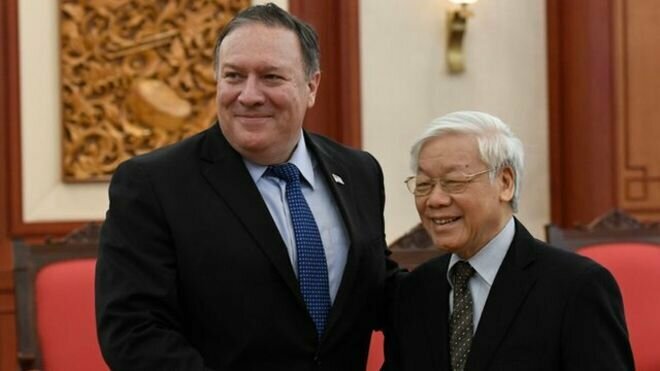 Mike Pompeo meets Vietnam’s Communist party boss, Nguyen Phu Trong. The visiting American Secretary of State, Mike Pompeo, has raised the case of a detained American graduate student during his talks with top leaders in Hanoi. His intervention may help secure an early release for Will Nguyen who was arrested last month during mass protests against government policy in Ho Chi Minh City. However, the visit of senior administration figures no longer raises hope in Vietnam of broader pressure over the country’s human rights record. Mr Pompeo was effusive about the warmth of relations between Washington and Hanoi, holding it up as an example to North Korea as to how former enemies can become friends to mutual benefit. The US administration has shown little interest in the latest wave of repression in Vietnam, with security forces being deployed en masse to stifle further anti-government demonstrations. 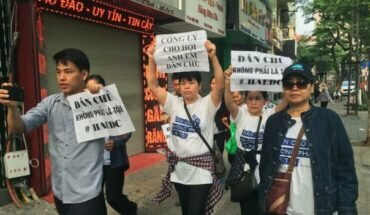 Nguyen is accused of “gathering and causing trouble” during the Ho Chi Minh protest on June 10 against new special economic zones and a cyber security law. State media said he had been seen urging local citizens to climb over barricades. The Texas born graduate student, currently taking an MA in Singapore, was filmed being dragged away by police after apparently sustaining injuries to his head. US consular officials have been allowed to visit him and he made a humbling statement on state television to apologise for his actions. 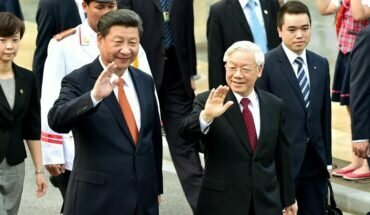 The Vietnamese authorities are likely to see his release as a cost free gesture in the interest of harmonious ties with the US. The Secretary of State, fresh from a much more confrontational visit to Pyongyang, said that North Korea should seek to emulate Vietnam’s miracle of economic growth. He’s also expected to discuss fears about China’s ever strengthening military position in the South China Sea. 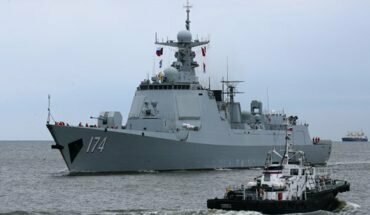 The Trump administration sees Vietnam as an important piece in the broader game of containing China’s ambitions in Asia, although its ties with Hanoi have been overshadowed by Trump’s ostentatious efforts to ease tensions with North Korea. The administration has much less interest than its immediate predecessors in violations of human rights in Vietnam. Activists in Vietnam fear the US approach gives a green light to the current crackdown on internet freedom and police moves to round up government critics and civil society organisers.